Eastern European and Russian studies. 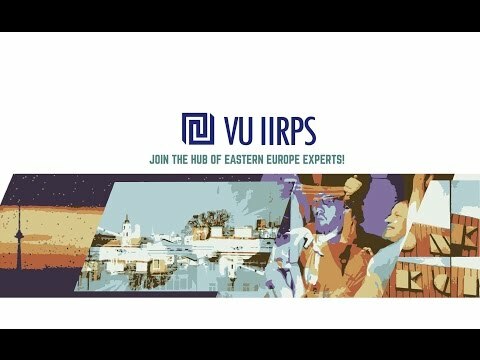 Join the hub of Eastern Europe experts! Join MA programme of Eastern European and Russian Studies (EERS) and explore the region from the base of cosy modern Vilnius! EERS is the home of a lively hub of field experts and practitioners offering you the opportunity to build a first-hand experience of Eastern Europe regional specifics by studying in one of the leading research institutions in the region. The summary about the program in PDF. Have you missed a public lecture or conference which was held at the Institute? There is a way out. We kindly invite you to follow us on the Youtube. There you will find newest videos of the public lectures and conferences. Want to know how our Alumni influence the world? Take a look at our success stories. Looking for something that would remind you of your stay in Vilnius and our Institute? Brand new IIRPS hoodies are ready to be ordered. For more information, just visit our Students' Representation office located in the IIRPS library building. „Western Writing and (Mis)understanding about Putin's War Against Ukraine: The Good, the Bad, and The Ugly"
Institute of International Relations and Political Science, Vilnius University will host Dr. Taras Kuzio who will give a presentation titled "Western Writing and (Mis)understanding about Putin's War Against Ukraine: The Good, the Bad, and The Ugly". This presentation will be based on his recent research and his book "Putin’s War Against Ukraine. Revolution, Nationalism, and Crime" (2017). Event will take place on 3rd of October, 5:30 PM, room 402. Dr. Taras Kuzio currently is a Senior Research Associate at the Canadian Institute of Ukrainian Studies, University of Alberta and Non-Resident Fellow, Center for Transatlantic Relations, School of Advanced International Studies, Johns Hopkins University. He is an author and editor of sixteen books, including Putin’s War Against Ukraine. Revolution, Nationalism, and Crime (2017), and (with Paul D'Anieri) The Sources of Russia's Great Power Politics: Ukraine and the Challenge to the European Order (2018). Dr. Kuzio is also guest editor of twelve special issues of academic journals, author of 37 book chapters and 99 scholarly articles on post-communist politics, democratisation, transitions, democratic revolutions, nationalism, and European studies. Taras Kuzio received a BA in Economics from the University of Sussex, an MA in Area Studies (USSR-Eastern Europe) from the University of London, a PhD in Political Science from the University of Birmingham, England and studied as a Post-Doctoral Fellow at Yale University. Dr. Kuzio is also guest editor of twelve special issues of academic journals, author of 37 book chapters and 99 scholarly articles. Prof. Sergei Guriev's open lecture "Growth Prospects and Challenges in Eastern Europe"
Vilnius University Institute of International Relations and Political Science together with the Ministry of Foreign Affairs of the Republic of Lithuania invite you to prof. Sergei Guriev's lecture "Growth Prospects and Challenges in Eastern Europe". Public lecture by Jörg Wiegratz: „Power and morals: capitalism, economic fraud and social harm in Africa and beyond“. The Future of the Nation and State is defined and formed by competent and talented individuals. I wish Institute to gather most of those progressive young minds and give them the key to our Future. Public Lecture by Sir Malcolm Rifkind "British Foreign Policy after Brexit"